Electoral Area D contains some of the most stunning and diverse scenery in the Squamish-Lillooet Regional District. It includes three oceanfront communities: Porteau Cove, Furry Creek and Britannia Beach, all of which host spectacular views of the Strait of Georgia and the forested islands that dot Howe Sound. The area is also home to the Britannia Mine Museum and a beautiful oceanside 18-hole golf course in Furry Creek. Electoral Area D also includes smaller rural residential and agricultural communities in the Upper Squamish and Paradise Valleys and Pinecrest Estates and Black Tusk Village along the Sea to Sky Highway Corridor near Whistler. There is no shortage of recreation opportunities in Area D, and the Callaghan Valley provides many of them in one location. In Callaghan Valley one has the opportunity to explore the natural beauty of old growth forest, ancient volcanoes, wetlands and wildlife around Callaghan Lake Provincial Park, then go for a cross-country ski at Whistler Olympic Park, site of the Nordic and ski jumping events of the 2010 Winter Olympic Games. 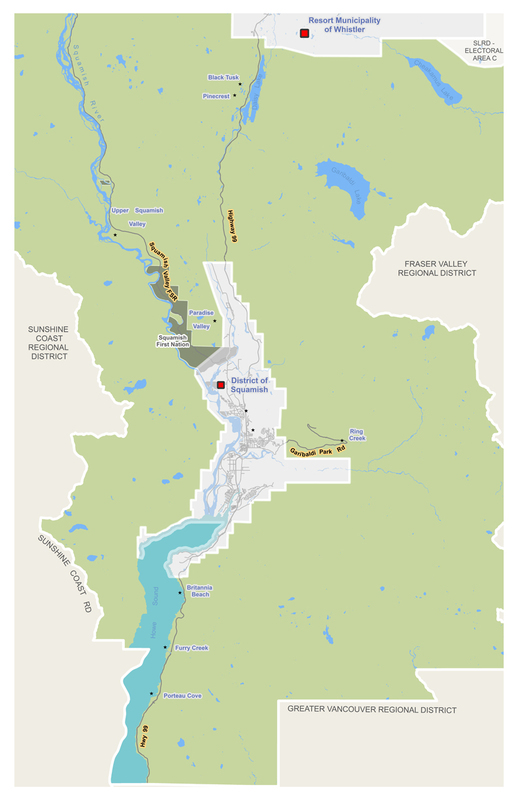 Electoral Area D is the southern-most area of the Squamish-Lillooet Regional District, bounded by Electoral Area C to the north, Metro Vancouver to the south, the Sunshine Coast Regional District to the west, and the Fraser Valley Regional District to the east.